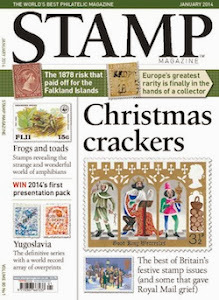 Have you read the May 2013 issue of Stamp Magazine yet? 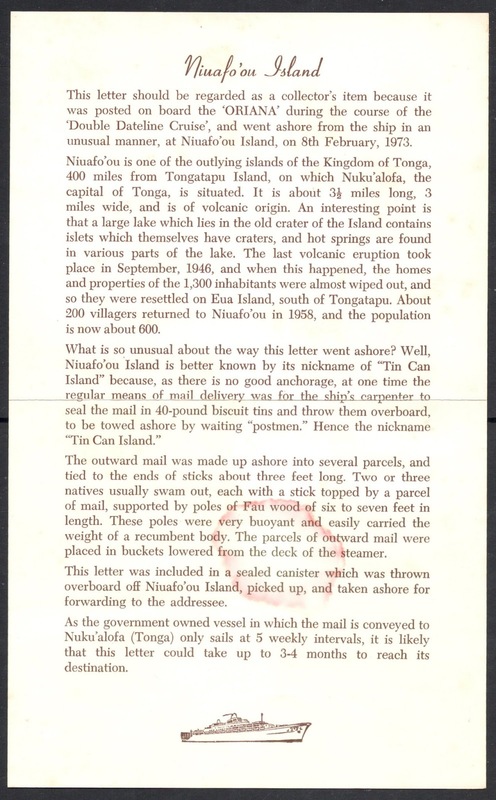 It includes a great feature on Tonga's Tin Can Mail, by Lewis Tauber. It reminded me of the few tin can items I have myself. I've dug them out to show to you. They're not from the time covered in the feature, which deals basically with the 1930s and 1940s, when this type of mail was very much a necessity rather than a philatelic novelty. But my covers are linked to fond memories, so they're precious to me. In fact, they're not even technically mine. They belong to Ricky, our former neighbour in Wales. He had worked as a chef in the merchant navy, sailing on luxurious ferry cruises. 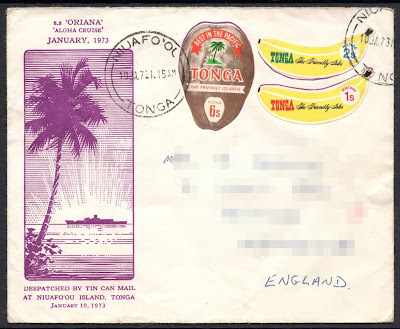 In the early 1970s he must have passed the Tonga island of Niuafo'ou, for he sent some tin can mail items to his family back in Britain. Ricky came back ashore for good in the late 1990s, went all over Britain to find the perfect place to live and ended up just a couple of hundred yards from us in mid-Wales. He became a very good friend, and, when things went slightly pear-shaped for him, he had to leave his home to look after his ailing mother in Hertfordshire. Before he left, he 'loaned' me his tin can mail items which he had kept as only souvenir from his days at sea, to keep them safe. For him this was the first step of letting go of all his worldly goods and he always said he would disappear from the earth once his mother had passed away. She has done so since, and Ricky has gone away, to Africa, without leaving any trace at all. So every time I look at these covers, I'm reminded of him and hope he's well. As you can see, these covers date from a time that the tin can mail phenomenon had become a tourist novelty. 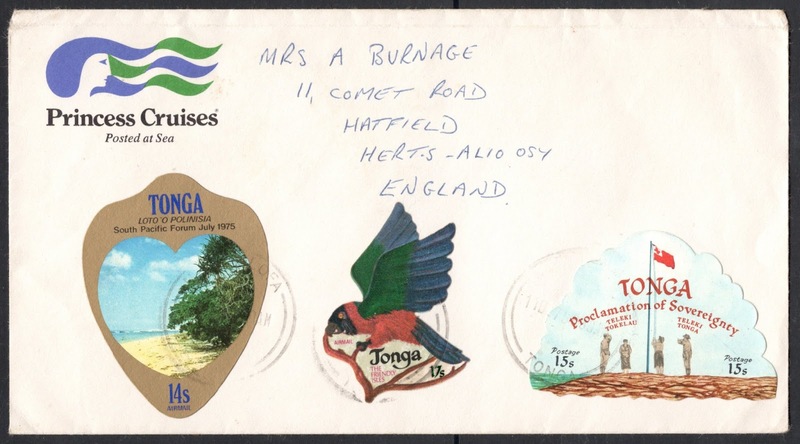 They even have the actual date of passing the island printed at the front, and if you look closely you can see the preprinted shapes of where the stamps should go. 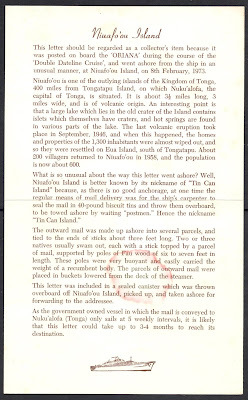 They also include an insert explaining a bit about this traditional way of posting mail. I have a few more covers from another cruise, again from the early 1970s although the Niuafo'ou postmark is too faint to read well. These, too, were posted at sea, and even though there's no specific mention of it, I believe these too were posted via the tin can way. Funny how gimmicky items do become more interesting with time! And with memories like that, they're as fond to me as any other cover.